Martin showcase an American Style Retro Refrigerator Roller Latch in Polished Nickel on solid brass. As well as kitchen cabinets it would add a fabulous and tactile quality to numerous other applications. 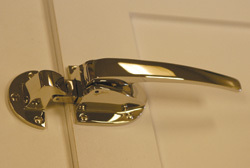 A complementary 3/ 8" offset hinge is also available and the latch can also be supplied to suit flush doors. These are some of the many new and innovative items from our Birmingham factory.